Arlington, TX Hair loss is much more than a physical phenomena. It is extremely emotional, especially for women who suffer from this challenge. There is no question that hair loss can be a devastating side effect of chemotherapy. Everyone wants to look good and feel good, without any permanent or temporary embarrassment from their image. While not all chemotherapy patients experience hair loss, in most cases people can experience thinning hair, while others dramatically lose all of their hair. The positive news is that hair loss is usually a temporary challenge for most recovering cancer patients. How long it takes to grow back varies from person to person. Most patients report new hair growth around 4 to 6 weeks after their last treatment. In many cases when hair does grow back, it may be a different texture or possibly a different color than it was before treatment. For those who find the process of hair re-growth and recovery grueling, professionally bonded hair extensions are an excellent option for recovering cancer patients, because hair can be color matched and customized to meet a desired texture and shade. In December 2007, Ellen Broom of Dallas was unfortunately diagnosed with breast cancer. Like many cancer patients, the beginning stages of her treatment were preoccupied with maintaining her health and to stay strong both mentally and physically. A wife and an active young mother of two boys, her initial concern was winning her battle with the disease. Ellen Broom began experiencing hair loss during her chemotherapy treatments. At first, losing her hair didn’t seem to bother Ellen because she understood that her body was acting in defense to the treatments. Fortunately, Ellen finally recovered from her breast cancer. Due to chemotherapy her hair wasn’t growing back in the same color or texture it did prior to the treatments. Ellen met with the educators and hair extension experts of SO.CAP.USA Hair Extensions ~ Texas at the Dallas-based Art of Hair Salon where she began the process of transforming her hair into a more desired look. The hairstyling professionals at SO.CAP.USA Hair Extensions are respected globally as pioneers in the field of hair extensions. The hairstylists and educators on the SO.CAP.USA Hair Extensions team provide a special type of care to each of their clients including those who are recovering from cancer and chemotherapy treatments. In order for a recovering chemotherapy patient to be a candidate for professionally bonded hair extensions, the hair must be from two to three inches and the patient in must be in recovery for at least six months. It is important for survivors like Ellen to become as informed as they can about the options of hair alternatives. Survivors should work as a team with their hair extension experts, understanding the entire process from initial consultation to application and home care. Luckily, with the help of SO.CAP.USA Hair Extensions and their team of expert professionals, Ellen finally gained her confidence back with gorgeous new locks. The Art of Hair Salon is dedicated to giving back to the community. Hairstylists frequently service local nursing homes and participate in school fundraisers. They continually support Locks of Love and are a participating salon with the national Pink Hair For Hope fundraiser to support the research work of the National Breast Cancer Foundation in concert with SO.CAP. USA Hair Extensions. The Art of Hair Salon has been internationally recognized in Passion International Stylebooks, various national consumer hair magazines and in numerous beauty trade publications. They have been written up in various national consumer hair magazines as one of the ‘Top Salons & Day Spas in America!’ A proud member of the National Cosmetology Association and Professional Beauty Association, The Art of Hair Salon carries exclusive product lines including All-Nutrient Haircolor, Peartin, White Sands, Enzo Milano and SO.CAP. USA Hair Extensions. They are located centrally between Dallas and Fort Worth and moments away from Hurricane Harbor, Six Flags Over Texas, Rangers Ballpark in Arlington and Dallas Cowboys New Stadium, The Art of Hair Salon is well on its way to becoming the destination salon in Texas! The Art of Hair Salon is at the top of the haircare industry, where their focus is on your hair. SO.CAP. USA Hair Extensions have been proudly recognized in many national consumer and trade publications including, Passion Stylebooks, Inspire Stylebooks, Celebrity Hairstyles, American Salon, Modern Salon, Salon Today, Salon Plus, Hairstyle Showcase, Cut & Style, Beauty Store Business, Salon Plus, Stylist & Salon Newspapers, Chair Talk, Hair Extensions Guide and Launchpad magazines. SO.CAP. USA Hair Extensions also proudly presents its annual Pink Hair For Hope program each year to support the National Breast Cancer Foundation. Whereas Ellen Broom’s story of health and happiness gives us a renewed sense of celebration for victory over one of life’s biggest challenges. To watch her video and her makeover photographs is just overwhelming. They will bring tears of joy to you as they did to her. This recurring challenge tugs on the heart strings of every woman and family who has suffered the pains and challenges of cancer. With the help of professional hair extensions, wigs and hair replacements services, every woman can now regain her dignity, sense of worth and pride while still looking and feeling good. 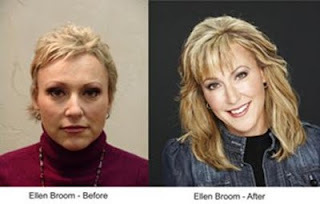 With the help of a professional hairstylist, Ellen Broom’s makeover story became a wonderful inspiration for all of us. For a complimentary hair consultation and for more information about SO.CAP.USA Hair Extensions or to find a SO.CAP.USA Texas salon near you, call 888-460-3031 or email Hanht@sbcglobal.net. Visit them on the web at http://www.socapusa.com/. The Art of Hair Salon at 2301 North Collins Street in Arlington, TX also offers complimentary hair extension consultations – 817-276-1166. Editorial Notes: Kerrin Delaney is a Marketing Coordinator at Marketing Solutions, a full service marketing, advertising, graphic design and PR agency specializing in the professional beauty industry. SO.CAP. USA Hair Extensions national office may be reached at 877-855-4247. For more information, call 703-359-6000, email MktgSols@MktgSols.com or visit www.MktgSols.com.